Length: 37 inches (940mm) O.C. Replaces: AYP 408010, 183533 V-Belt for Snow Blower Impeller Drive. Replaces Poulan snowblower part 183533; auger drive belt Model PP 1130ES. BX34. 37 inch (OC). 0.66" Wide. 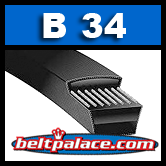 Cogged Power Ace BX-34 Belt.